When the Chinese delegation was led into the Pyeongchang Olympic stadium at the opening ceremony of the 2018 Winter Olympics one month ago, they sported white outfits that caught the attention of sports fans. This outfit was produced by ANTA Sports, China's leading sportswear brand with a market value ranked third in the industry globally, after Nike and Adidas. "We reached a partnership agreement with the Chinese Olympic Committee (COC) for cooperation in the fourth Olympic cycle starting in 2009," said Ding Shizhong, CEO of ANTA Sports. Last year, ANTA sold 60 million pairs of shoes and 80 million pieces of clothing, bringing its market capitalization to over 100 billion HKD (about $12.8 billion) as of January 2018. ANTA is based in Jinjiang, East China's Fujian Province, a city known as the world's largest production base for sneakers. Jinjiang produces 40 percent of the country's sports shoes and 20 percent of the world's, with many big brands like Xtep and 361 Degrees produced there. Since China's reform and opening up in the 1980s, merchants from Jinjiang made use of the city's geographical advantage to sell goods from overseas to other parts of China. Many of them found that sneakers were especially popular. In 1987, 16-year-old Ding brought sneakers produced in Jinjiang to Beijing. Four years later, he started up ANTA company, although "there was still no such concept as sports footwear," he recalled. But Chinese people began falling in love with trainers. "There were wholesale markets all over China," Ding said. Ding described the growth of the industry as "explosive," with the number of sneaker factories in Jinjiang mushrooming. The industry reached its peak in around 2008 when China hosted the summer Olympics. At that time, Jinjiang was home to more than 3,000 factories. In the cut-throat competition that ensued, many of the brands once advertised by celebrities were gone, leaving ANTA, Xtep, 361 Degrees among the survivors. Ding Shizhong says the secret to his success is innovation. 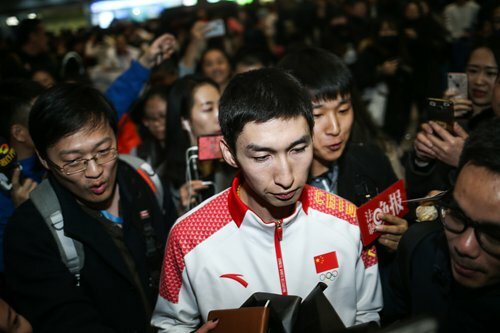 "In 2005 ANTA set up China's first high-tech sports science lab," he said. Expenditure in research and development grew from one percent at the beginning to its current level of 5.8 percent of annual revenue. ANTA has also set up design centers in the US, Japan and South Korea. "In China, the middle-class is rising," Ding said, explaining that this is how ANTA managed to acquire several international brands, including FILA, Descente and Sprandi. These acquisitions have brought more customers from high-end brands and introduced ANTA to a global market. The Celebrity Effect was another method used by companies. ANTA and 361 Degrees have signed with NBA basketball stars such as Kevin Garnett and Klay Thompson to promote their brands internationally. Thanks in large part to the rising influence of Chinese brands, China's sports industry has grown rapidly over the past several years, with a total output of 1.9 trillion yuan (about $294.1 billion) in 2016, according to figures jointly released by the General Administration of Sport and the National Bureau of Statistics in January. By 2025, the scale of the market is expected to reach 5 trillion yuan (about $773.9 billion), according to a government plan. Along these lines, China will build a collection of domestic sportswear brands that are strongly competitive in the global market. In 2016, the total value of Jinjiang's sports industry had reached 147.2 billion yuan (about $23.3 billion), contributing to 34 percent of the city's overall industrial value. In the long run, the "city of sportswear" aims to upgrade itself to the "city of sports." Recently, the Jinjiang government mapped out a plan to speed up its sports industry through investment, technological innovation and public service. It says that by 2020, the overall scale of Jinjiang' s sports industry is expected to reach 180 billion yuan ($28.3 billion). Jinjiang will host Gymnasiade 2020 and four consecutive FISU University World Cups in football in 2019, 2021, 2023 and 2025. These events will be a great opportunity to show the world that Jinjiang is more than a city with a booming manufacturing base, placing it at the center of the world sporting stage.